The Bixby-enabled appliances will reportedly learn usage patterns over time and also provide insights for efficient operation. Samsung could soon integrate its intelligent assistant, Bixby, with its home appliances like Televisions, washing machines and more. As per a BusinessKorea report, the company will be launching home appliances featuring the smart assistant in the first half of this year. Samsung already has a Bixby-powered refrigerators, air conditioner and of course smartphones, which were launched last year. According to the report, Samsung’s first Bixby-based television will launch in March, during a press event in New York. "The time of the launches will vary slightly from country to country," a Samsung Electronics official said. “It is part of a strategy to load Bixby into all of our products by 2020." Samsung TVs with Bixby are expected to come with a service which enables users to find content easily, whereas the washing machines could recommend to consumers washing courses and the amount of detergent to use. In addition, these devices could be much smarter and are easily diagnose product errors, learn frequently used washing methods and order detergents as well. "If experiences provided by Bixby are differentiated, Bixby can secure a solid position. Otherwise, it can weaken the competitiveness of Samsung's home appliances," an industry official said. The report says that Samsung Electronics is pushing smart assistant based home appliances for accelerating its AI learning as the company wants to compete with other smart assistants from the likes of Google and Amazon. 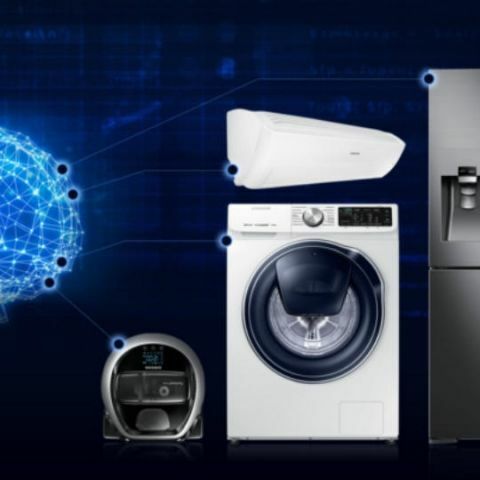 The smartphone manufacturer recently detailed its new AI and IoT-based HomeCare Wizard service solution, which debuted with the WW8800M washing machine. Similar to the Bixby enabled devices, the HomeCare Wizard can also track the statistics of a device and perform self-diagnosis for smart appliances to "enhance efficiency and to help users use their appliances better.” It can make use of AI and machine learning for developing insights about usage patterns, energy consumption and provide information to users. You can read more about the HomeCare Wizard service here. Compare quality of MOTO E with Nokia Lumia 520/525/ Samsung Galaxy Trend and other such renowned phones. which is the better printer to buy for home purpose with availability of cartridge and everything ?